To “chillax” means to both simultaneously chill out and relax. Sounds good to me! And the perfect chillaxin’ wind down is a great bubble bath and a book. Here is a recipe for some bubbly goodness paired with the earthiness of Patchouli, sweetness of Orange and balancing notes of Rose for a perfect bath time essential oil blend. 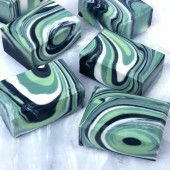 Plus, these solid bubbling bath bars harden up pretty fast, so you can get your bath time on quickly. Click here to add everything you need to your Bramble Berry shopping cart! 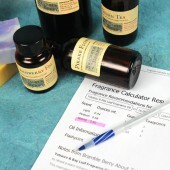 ESSENTIAL OIL PREP: Blend the essential oils to create the “Chillax Blend”. 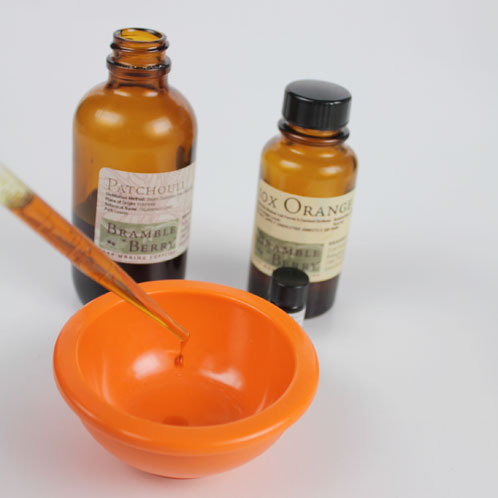 Mix 3 mL Patchouli Essential Oil, 8 mL Orange 10X Essential Oil, and 1 mL Rose Absolute Essential Oil. ONE: In a bowl big enough to get both hands in, mix together the Sodium Bicarbonate, Cream of Tartar and SLS. 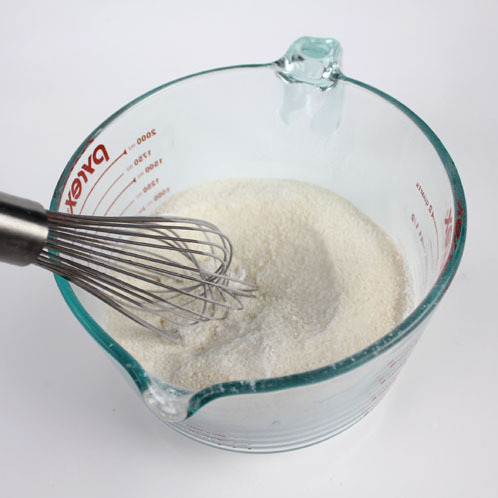 Use a whisk to fully mix the ingredients together, but whisk slowly because these ingredients can (and do!) go airborne easily, tickling delicate noses and throats. NOTE: Sodium Bicarbonate and SLS can both tickle your nose, so wear a mask if you’re sensitive. 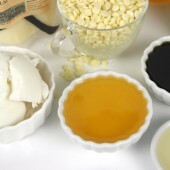 TWO: In a separate, smaller container, mix together the Liquid Soap Concentrate and Chillax Essential Oil Blend. Notice it’s a naturally dark color. 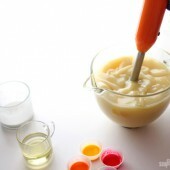 THREE: Pour the Liquid Soap mixture into the dry ingredients. 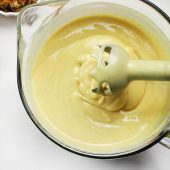 Mix the wet and dry ingredients initially with a spoon or spatula, then switch to your hands and knead together until the ingredients are fully incorporated. 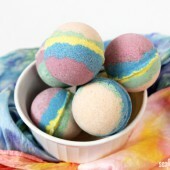 FOUR: Once the ingredients are well mixed, plop the bubble bath dough onto a sheet of wax paper. 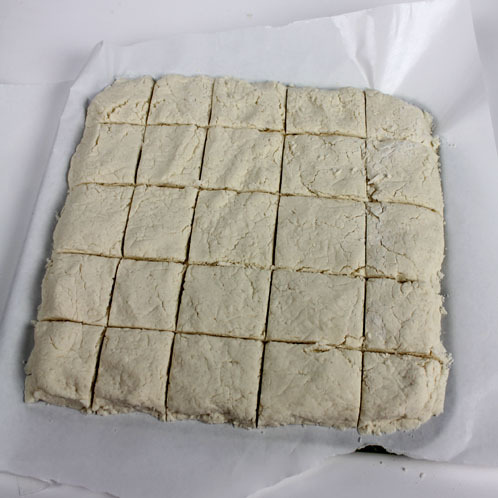 Spread out the dough to desired thickness, and cut how you’d like. I went with simple squares, but try using a Heart shaped cutter or Circle cutter for added interest. There are lots of options. FIVE: Allow to sit and harden overnight. 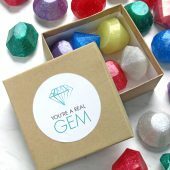 Use right away, or wrap in air-tight packaging for use later or as a gift. TO USE THE SOLID BUBBLE BATH: Crumble under running bath water. 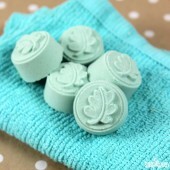 If you’re not using it quickly, package the solid bubble bath bricks up in cellophane bags or wax or parchment paper. These work best when they’re slightly moist so they crumble easily under running water. If you just toss them into a bath, the result is less than astounding. Definitely crumble these under warm running water unless you want to be underwhelmed. 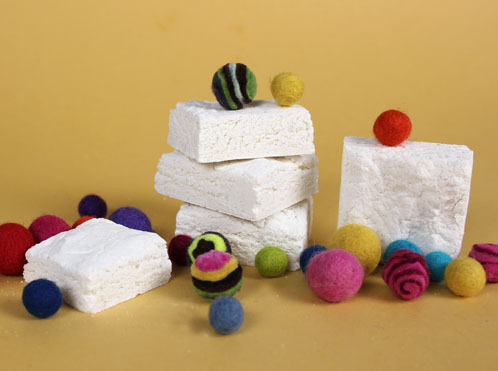 If you wanted to add color to this recipe, a La Bomb colorant would be great. Previous Post: Does It Get Easier? 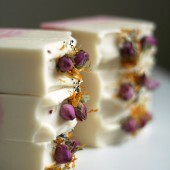 Can i put dried rose petals or lavender in the mix? I made these tonight and the dough kept expanding at an alarming rate. I put the dough in a silicone cupcake pan and the dough ballooned out of the cavaties very quickly. I patted them back down twice before they stayed put. Is it supposed to do that or did I maybe goof something up? If these bars are exposed to excess moisture, they can start to fizz prematurely. I’m wondering if that’s what’s happening here! Can I put this recipe in a mold? 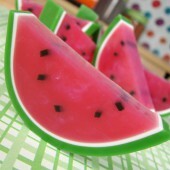 We haven’t tried this recipe in a mold, but I believe that would be OK! It may work well in our 9 Bar Unfinished Birchwood Mold. 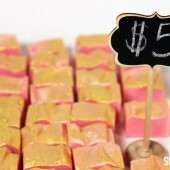 Hi, LOVE your products and can’t wait to use the Soap concentrate however, I have a question, I saw the video tutorial for the 2 colored roll, I made them and the bubbles were great but waiting for the bubble bars to dry took forever, I gave up and used them in the 4th day while they were still moist. 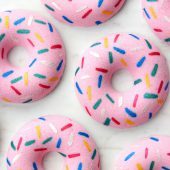 I want to sell these bubble bars but will this recipe maintain some moisture or do they have to be used in a few days because they dry up quickly? If they dry up quickly can I add castor or glycerin like the video recipe? Any help would be great before placing my order, thanks! Depending on the temperature and humidity of where you live, those bars can take a couple extra days to dry out. do you still recommend this recipe? or should i use the other? I’m sorry, I’m not sure which recipe you’re referring to. Do you mind pointing me in the right direction? Thanks! 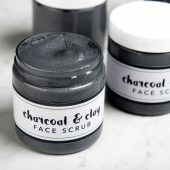 Can i substitute cream of tartar with arrowroot powder? and still have the same effect? Simply – no. 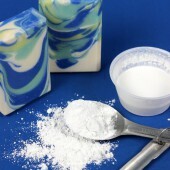 Cream of tartar is an acid that is a byproduct of wine. 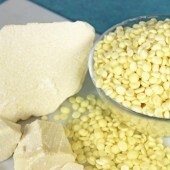 Arrowroot powder is tapioca starch (great for keeping things together). If you want a substitution, try citric acid for a similar effect. I made the solid bubble bath yesterday. Came out wonderfully but it somewhat stuck on the freezer paper, later I realized that I forgot to use baking soda. 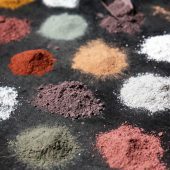 I used mica for coloring but wonder if I can use powdered pigment or mica with oil so that I can get two colors from one batch rather than to make two batches. Also, to get two colors you can split this batch in half and color each. I’m so excited to try these! I’m hoping to sell these at my stall, I was wondering what the best way to package these would be? 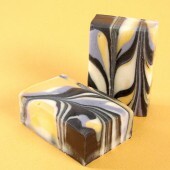 I usually leave my soaps ‘in the open’, would it be ok to present the bars in my usual wooden box or do I need to wrap them first? Thank you so much, I love your blog! Here are some packaging products, I’m sure they will give you some ideas! Thank you so much! I wasn’t sure if they would be ‘activated’ by leaving them in the air like bath bombs tend to do. 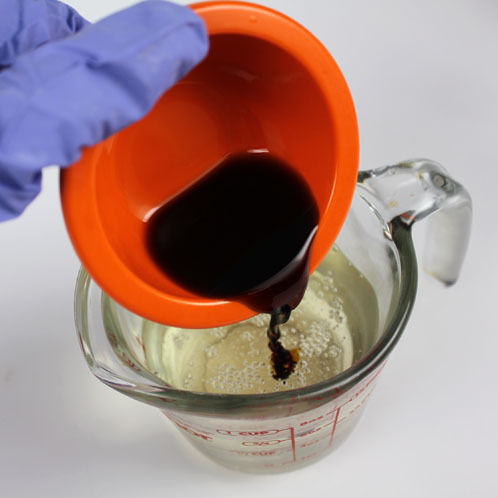 Can I use liquid SLS instead of the powder form in this receipe and how much should be used? 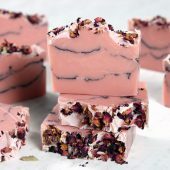 You could experiment with the liquid version, but I would be afraid that it would dramatically change the texture your bars would not harden up. I would recommend sticking with the powder form 🙂 If you give the liquid a try, let me know how it goes! Yesterday I made the solid bubble bars and they came our great. 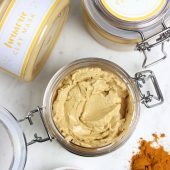 Do I need to add preservatives to the base before I sell them to the public? If so, Which is the correct one to use. 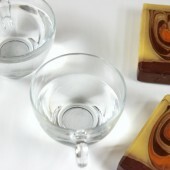 Can I use glycerin instead of the soap concentrate? You do not need to use a preservative for these :). 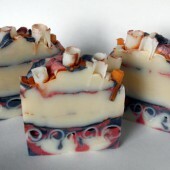 The pH level of soap does not allow for bacteria to grow, so you don’t need to worry! 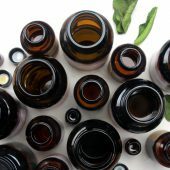 If you are interested in more information regarding preservatives, you may find these posts helpful to you. If you get photos of this project, we would love to see them on our Facebook page! I made these yesterday, boy they make SUCH wonderful bubbles. I can’t decide how to package them though. I am afraid if I just wrap them, they will crumble to bits! 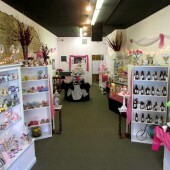 I don’t sell anything, but I do want them to look pretty! 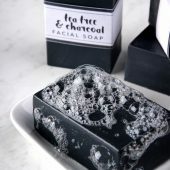 Can I put these bath bars in a mold? Will they be hard to remove? Can I do a two color roll (where it looks like a cinnamon roll swirl)? Because this recipe is so sticky, we found they actually start sticking to the sides of the mold. But you could give a mold a try, let us know how it turns out! You are so in luck, Anne-Marie made a two color roll tutorial and I think you’ll love it! 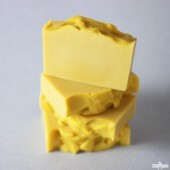 Can liquid SLS be subbed for the soap concentrate? 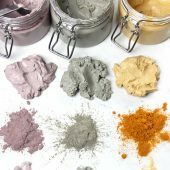 How do I use labomb colorants? Do I dilute it or use as is? And how much do I use for this recipe? 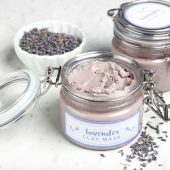 We are a fragrance free house hold and I am wondering if this recipe suffers at all by excluding the fragrance oils. Should there be a bump up in soap concentrate or anything? Your input is so appreciated! 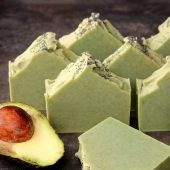 The solid bubble bath bar recipe is actually one that Anne-Marie worked with over a year until she got the ratios and the ingredients exactly perfect to create a solid bubble bar. 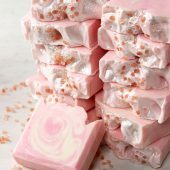 Citric Acid is actually what make the bath fizzies, well, fizz, so that is one ingredient that you are going to want to keep in your recipe. If you want to play around with the ingredients, I would suggest making small test batches of what you want to do to see if it works for you! Could I substitute bubble bath for the liquid soap concentrate?? What kind of bubble bath is it? 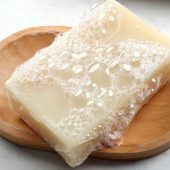 You can try substituting the bubble bath for the liquid soap concentrate, but I would do so in a small test batch to see if you like how it turned out. 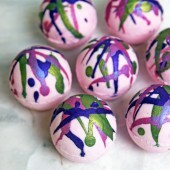 You can also try this other solid bubble bath recipe that I just adore. Yeah promote SLS aka palm oil…… its not getting grown in your forests is it. 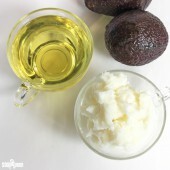 You can make this particular recipe without the SLS (Sodium Lauryl Sulfate) but it you aren’t going get as big and fluffy of bubbles without it. 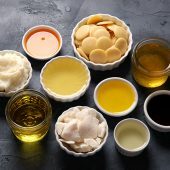 We definitely do appreciate bringing up your concern about Palm Oil and here is a great post by Anne-Marie that she wrote last year that goes into detail about some of the sustainability issues. 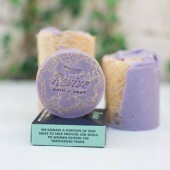 And the bubble bars looked really nice this morning, if a bit fragile. Can’t wait to test them on the kids! Oooh, how exciting! You can always let them sit out a bit longer so they have more time to harden. We’d love to see pictures of your bubbly creations on Facebook! Just to get this straight, for bubble bath, do you mean 5 parts liquid soap concentrate and 1 part water? Or the other way around? Made this with my daughter tonight, although I’m a bit skeptical since it seems more frothy than doughy. The most important thing though, is that because I bought this as a kit I now have an entire jug of liquid soap concentrate and no real instructions on what to do with the rest of it. 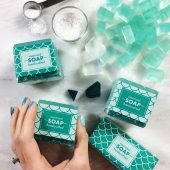 You can also dilute the Liquid Soap Concentrate base up to a 5:1 ratio with distilled water to create such fun product like bubble bath, shower gel and hand soap! 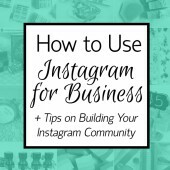 If you are looking more towards getting a bubble bath, you will want to go with the 5:1 ratio. But, if you are like me and love your shower gel, I would use a 2:1 or 3:1 ratio. 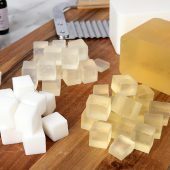 I hope this helps and we can’t wait to hear more about the fun things you will be making with the liquid soap concentrate! I was wondering if using micas or oxides colors would work for this? Would the color bleed in the water? Thanks for the suggestion of the La Bomb colors, but what if you didn’t want the dyes? 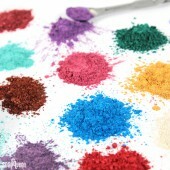 Can you use Micas and oxides to color these? Are there any health issues (lip and eye safe required?) to using them in a bath? Any suggestion on amounts? 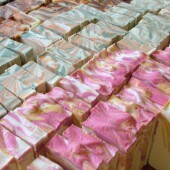 The pigments make amazing colors and the micas make swirly ribbons in the water (I’ve done a little dabbling…). But I can’t find anything online about safety and amounts. Any thoughts would be appreciated! 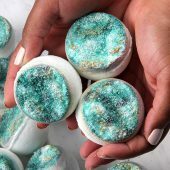 You do not need to worry about using lip or eye safe micas in your bath bombs, largely because it is a wash off product rather than a leave on product like lotion or lipstick. 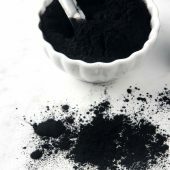 There is not a specific usage rate when it comes to using micas in bath bombs, but there is a tendency to over color them…you need a very small amount! I would recommend adding a teeny tiny bit at a time until you reach a color that you like. I can’t wait to try this recipe! And I have a question about the liquid soap concentrate. 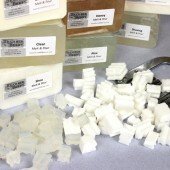 I make my own liquid soap. 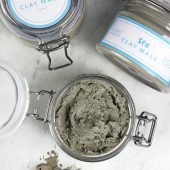 Is it possible for me to partially dilute my own paste? 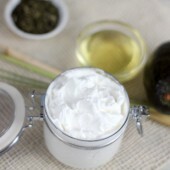 And is there any thing that can be added for moisturization and make this recipe double-duty? 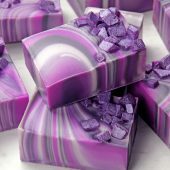 You can use your own liquid soap concentrate in this recipe, but it might not be as bubbly and foamy as the Liquid Soap Concentrate that Bramble berry sells. 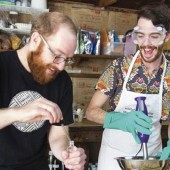 If you do try it out, make sure to make a small test batch and see if it works for you. I made the bubble bars and they turned out great. Although I did have a hard time working with it. I rolled it out and used a cookie cutter to make shapes. I found that it was drying out and becoming crumbly really fast. I used alcohol to re moisten the mixture but it was a bit difficult. Is there anyway to keep it moistened enough to work with or do I just need to move quite a bit faster? The overall result was amazing the chillax fragrance was perfect!! I could use it in every bath!!! I know it will be a great item to sell!! Good morning, Belle La Vie! I’d love to help you troubleshoot what happened. When you were making this recipe, did you substitute or change anything in the recipe? We did find that we had enough time to work with them and shape them with our hands before they began to harden. 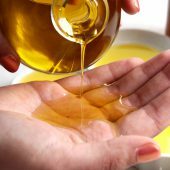 I just made some solid bubble bath with your recipe, but substituted natural liquid castile for the liquid soap concentrate. The bars came out a beautiful bright pink and the “dough” was so easy to work with. However, I used it in a bath last night to test the bubbles and I was not impressed. The bath water turned a lovely shade of gurlie pink 🙂 and it smelled great but the bubbles were gone before the bath was half filled. The bubbles I did get were kind of small and foamy. I crumbled it under the running water…how can I get bigger, more long lasting bubbles? My SLS is about a year old, does it maybe need to be replaced with fresher sls? Anything else I could try? I had so much fun making them! Thank you for the recipe!! Hi Becky! 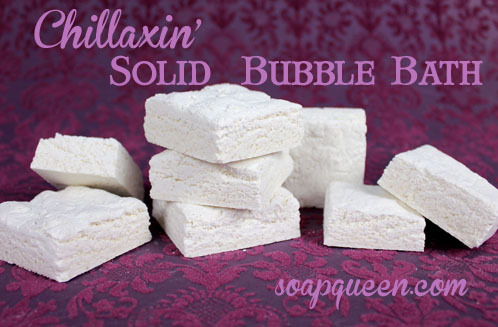 I had to report back on my newest batch of solid bubble bars. I followed the recipe to the letter and my bars turned out great! I colored them with lilac la bomb, scented with lavender eo and put lavender buds on top. The water turned cold before my mountains of bubbles went away. 🙂 Thanks so much for your help! Good morning, Brianne! I’m so happy to hear that it turned out so well. I bet they smelled just fabulous. If you have any pictures, I’d love to see how they turned out. You can share them with us on Bramble Berry’s Facebook page. 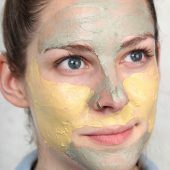 Buenas tardes,en el ultimo momento adicionamos una cucharada de arcilla en polvo,en el momento de des moldar los jabones se fracturaron, que pudo haber pasado,por favor deme una luz, gracias. If using citric acid in place of cream of tartar, would the ratio be 1:1? Thanks for the question, Jessica! 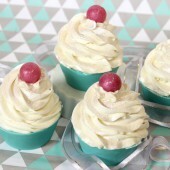 If you put the Citric Acid in place of the Cream of Tartar in this recipe, it is going to act much more like a bath fizzy instead of a solid bubble bath bar. If you were to do it, I’d make super small batch to see if you like how it works for you. I was wondering if there might be a substitute for the liquid soap concentrate? I was thinking maybe vegetable glycerin might work. I am not sure if the liquid soap concentrate provides most of the bubbly action (I know the SLS does too) or if it is mostly used as a binder for all of the dry ingredients. Thank you in advance. Hi Melissa! 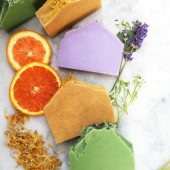 You can use other liquid soap concentrate bases like our Natural Castile Liquid Soap Base or any other concentrate base, because it gives the bubble bars that fun foam. Unfortunately, vegetable glycerin isn’t going to the same thing. how would you substitute the powder for a bubble base? 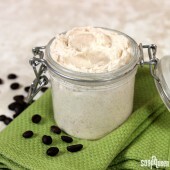 do you have a recipe for this and what it should look and feel like with this change? If we wanted to make a two-color roll, at which stage would we divide and add colorants? 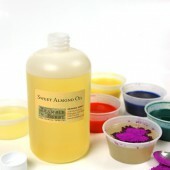 How do you add colorants? Knead them in? 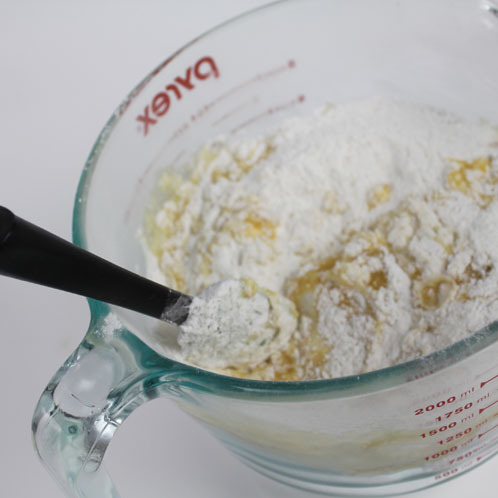 PS – I divide after the wet/dry ingredients are mixed together but before adding colorants. 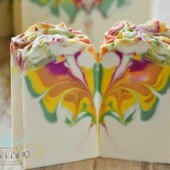 This looks great, can the liquid soap concentrate be subbed with something like Castile liquid soap? 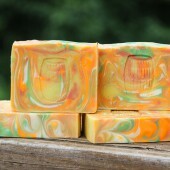 You can sub out the liquid soap concentrate for the Natural Castile Liquid Soap Base and still have it turn out great! I love solid bubble bath! Thanks for sharing a great recipe. I can’t wait to try it. You will love it! I just had such a fun time with the bubbles in the bath and I think it is perfect for anyone (kid or adult) who enjoys a good bath. =) When you do end up making it, let us know what you think. Thank you so much! These look great. I hope to try them soon. You will just love it, Pam! Keep us updated on your progress and if you get any pictures we’d love for you to share them with us. You can do that on Bramble Berry’s Facebook page. Definitely – you can use the SLSa as a straight sub in this project. Love these, but is there a way to make them using something besides SLS for the bubbles? So many of my customers are avoiding SLS like the plague. If i want another fragance how much do in need? Is there a gentler alternative to SLS? I can’t use it personally, and my customers don’t want it either. I was thinking maybe Citric Acid? I use that in bath bombs. If you get an answer I’d love love love to know it as well. 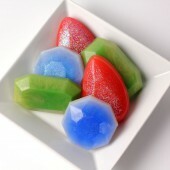 There’s not much else besides a synthetic surfactant to make those delicious, amazing bubbles. Citric Acid helps to provide fizz but not lasting bubbles in the tub. Can you use Sucrose cocoate instead? I read about this today its from sugar and coconuts and seems to be less irritating. I’m not familiar with it tho. 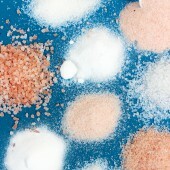 Sodium Lauryl Sulfoacetate (SLSa) is a good alternative. I believe Bramble Berry sells that as well.